Here is my last $0 project for the month of March! Have you seen the Ikea commercial for their Winter Sale? It starts with a woman looking at her receipt in shock and running out the the store yelling "Start the Car!!!" Well that was me last week. No, I didn't cheat on my $0 budget month and head to Ikea, I went shopping at the Sidewalk Boutique (Thank you Amy at Chestnut Tree Lane for the wonderful new saying! I no longer have to tell my husband I pulled something out of someone's garbage). So I was driving to pick up my kids at our wonderful home daycare (Hi Bonnie) and I spied a gorgeous cream colored headboard being featured in the Sidewalk Boutique :). I drove past at such a slow speed you could have walked faster. But knowing my husband would roll his eyes, I drove past. When I got to the daycare, about 5 houses down, I knew I had to go back. With the support of another woman who loves a great deal, I ran back in my high heels to see what it was like. I was in awe...so beautiful! Well it was actually hideous but I knew with some paint it would be amazing. Here is where the Ikea part comes in. I am a pretty tall woman and with 3 inch heels on I am a good size...well just image me running with this queen size headboard over my head down the street yelling "open the van". Hoping that no one would see me before I managed to wrangle it into the back of my minivan. Bonnie and I wiggled and pushed and somehow managed to get it in. All while her husband (thinking exactly what my husband would be thinking) laughed at us. I knew my husband would not be overjoyed so when I got home, I carefully (meaning secretively) moved it into the garage and did not say a word. I didn't hide it but I knew once it was in the house it was easier to keep. Well it took him a couple of days to find and all I got was a few "garbage digger" comments. Well worth it in my opinion! And the amazing after. Look what a can of Heirloom White spray paint can do! That is my last $0 project for this month! What have you done with $0? *Party is open to any project you've made or created with materials you had on hand. So $0 Budget!! *Please do not link to Etsy shops because they cost money :). Remember $0 Budget. *Link to your actual post title (not your blog homepage). If you need help, send me a note and I can help you. 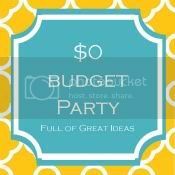 *It would be nice if you added the $0 Budget party button to your post (code above) or a link back to the party and if you Followed me but this is not required. *Please visit other people's ideas and Leave Some Comments. We all love comments! I hope everyone has a fabulous weekend and lets PARTY! I LOVE that headboard! I would have gotten it too. Any looks you get are just ones of jealousy at your awesome thriftiness! Hi it's your new friend from Oregon and I can't figure out how to link the actual post. Can you email me! Sorry new to the linky thing! Hi again, I did it!!! thanks to Google university! The headboard is great. I see those all the time and pass them up. I'll be back later this week to post my $0 crafts! So excited! love love love the headboard and even love the funny story more !!!! I'm new to your blog and loving catching up on it! You have great ideas. I joined the party but my linkback is pathetic-- I'm still learning but hopefully I'll be able to get it right soon. The Sidewalk Boutique is where are the cool kids shop. ;) LOVE the headboard! You totally cracked me up! The headboard was totally worth it. It came out beautifully! I love it! I too shop at the sidewalk boutique whenever possible (even though it used to embarrass me when my mom did this)...and my heart races when I am trying to get my score into the car. I love the headboard! I need to start eying thrift stores so I can make one like it! You were so smart to snag that deal on Street Boutique day -- it looks great painted! Great headboard, and I have really enjoyed your 0$ march experiment! I linked up a project, but I think the code in your link button might be off. I don't get a link button when I use your code on my blog. Any ideas? This post is cracking me up, i have always wanted to find an awesome item at the street boutique...the headboard looks awesome!